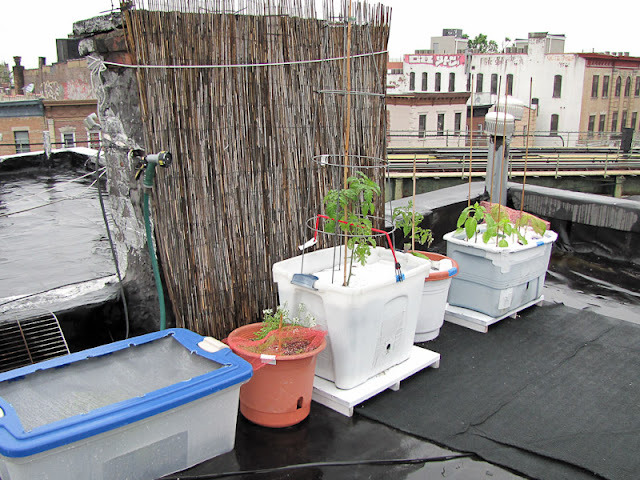 Bucolic Bushwick: All Systems Go! There are a lot of photos in this post so slow Internet connections beware. 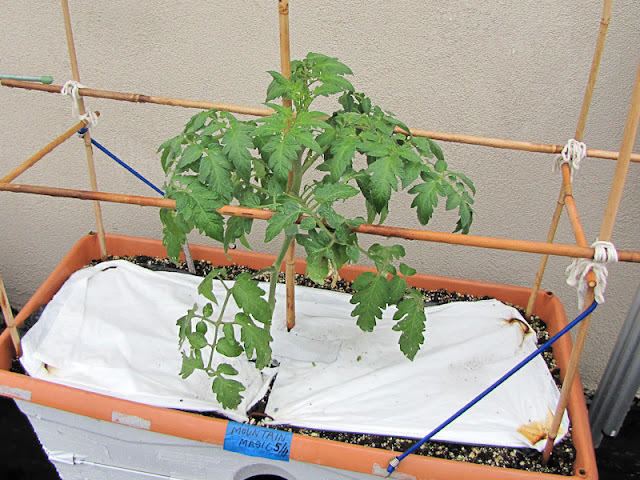 In the photo above the three, 16" diameter pots near the reed fence have 3 Hakucho Hybrid melon plants. These were planted on May 18th. 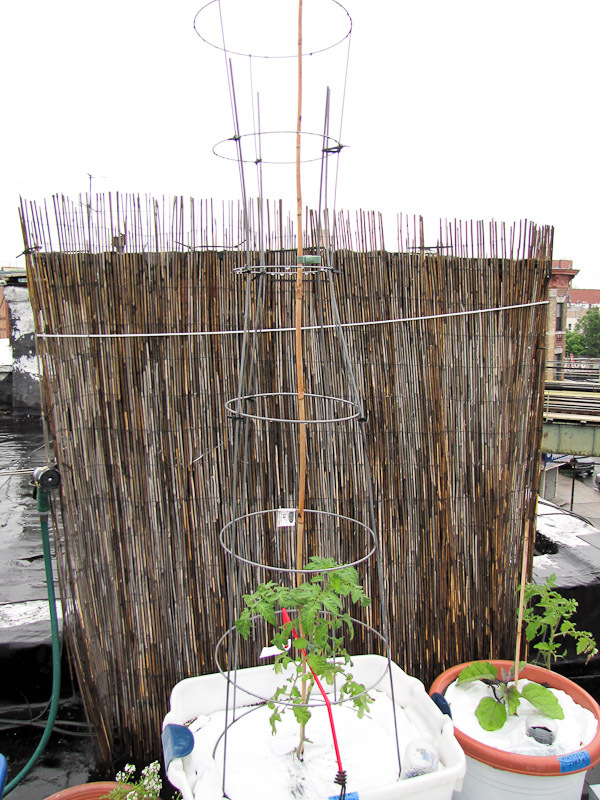 Next to that is the Southern Patio Jumbo Growing Tower with 3 Flexum Hybrid pepper plants, planted May 11th. 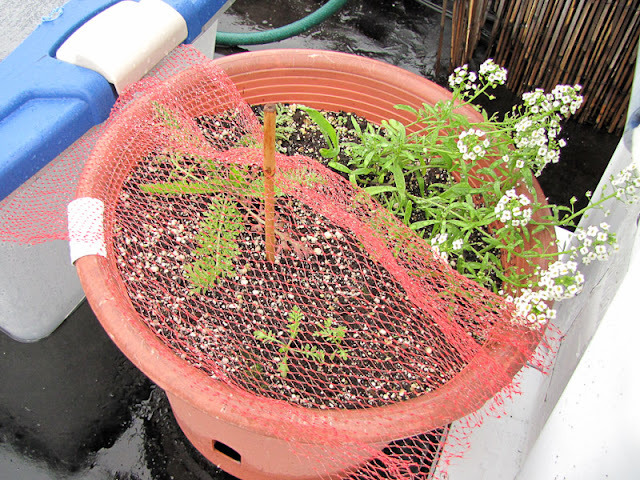 The non white container has flowers to attract beneficial insects. The mini greenhouse has my leftover seedlings, these will be given away. The non white container has flowers. 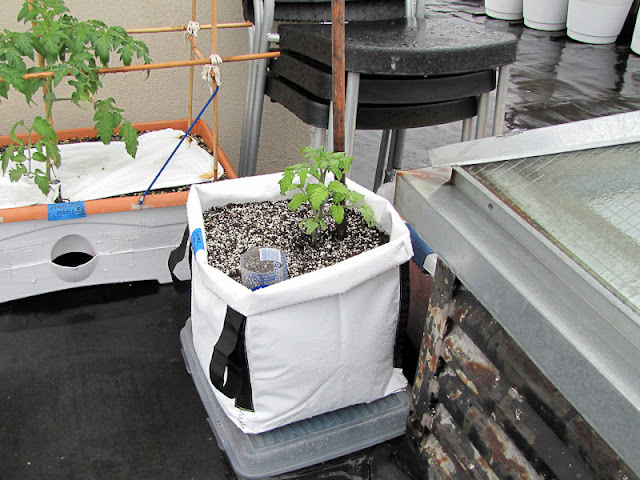 The 22 gallon tote has 1 Black Cherry tomato plant, the 16" pot has 1 Pingtung Long eggplant and the 18 gallon tote has 4 Giant Aconcagua pepper plants. All of these were planted on May 11th. The Black Cherry tomato has a tall cage. I took a large cage, flipped it over, and zip tied a small cage to the spokes that usually go in the ground. 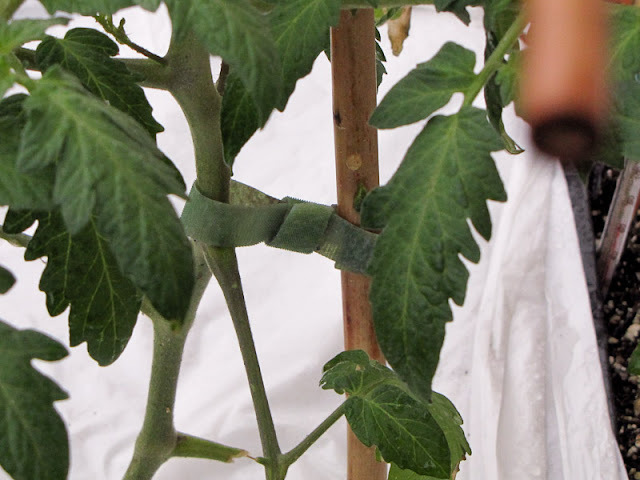 These spokes are too tall to be slipped into the soil, the resulting structure would be quite wobbly, hence this alternative. The wide base makes it nice and stable. A bungee cord was added for extra security. 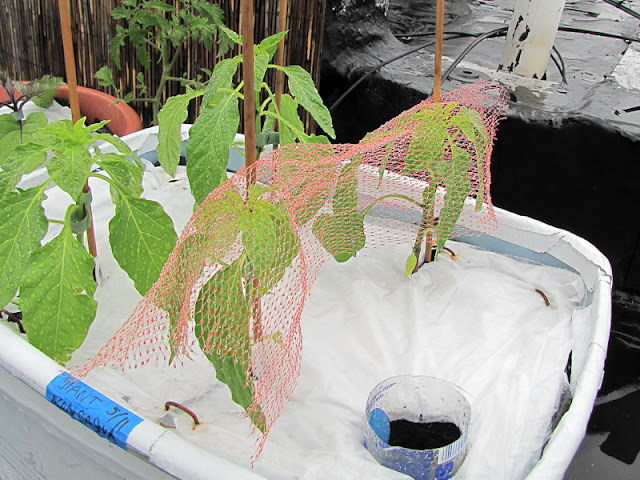 Some birds have been biting the leaves off the smaller pepper plants so I put netting over them until they get larger. 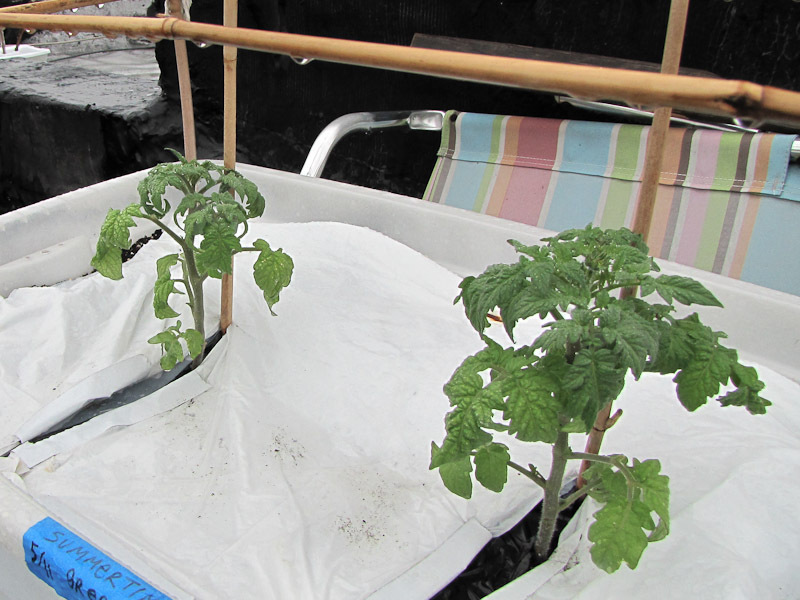 The netting us just re-purposed onion bags. More netting for the smaller flower plants. I don't know why but once plants reach a certain size the birds stop trying to eat them. I just hope they don't change their mind and decide to bite them when they're bigger. I don't have enough netting for the entire garden! 2 Summertime Green tomato plants, planted May 11th, in the 26 gallon tote. More flowers in the non white pot. 1 Summertime Green tomato in the Garden Patch Grow Box on the left and 1 Mountain Magic tomato in the Garden Patch Grow Box on the right. These were planted on May 11th. 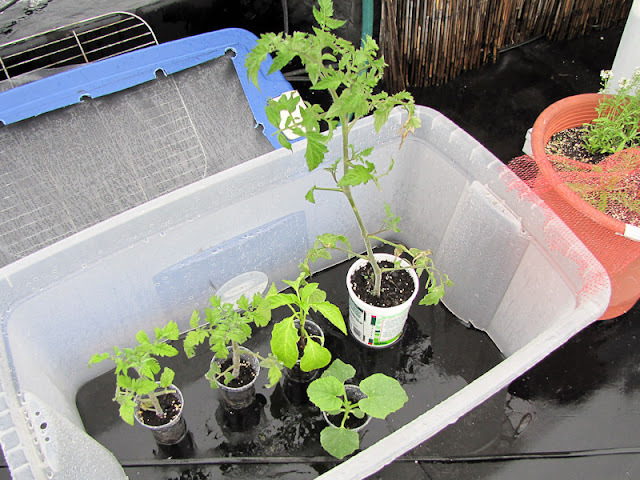 The one new container I added to the garden this year, the white cube with black straps, has 1 Summertime Green tomato, planted May 17th. 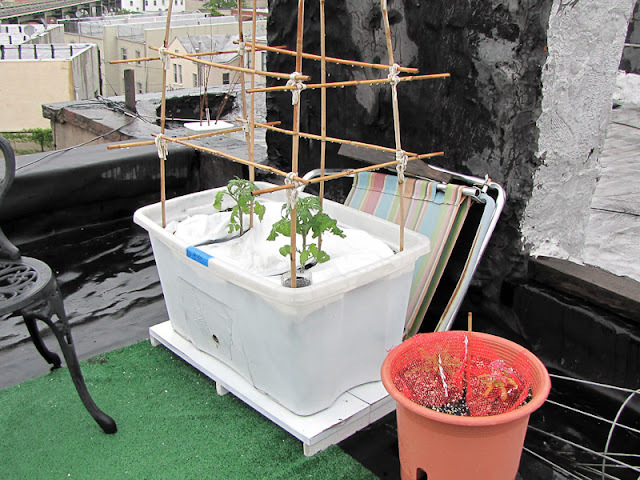 The new container is the 12" gro planter from CB2. This is a standard planter so, of course, I converted it into a self watering container with my usual directions. My sister gave me several of these planters for Christmas, but I did not feel like lugging bags and bags of soil up to the roof this year so the rest will have to wait. 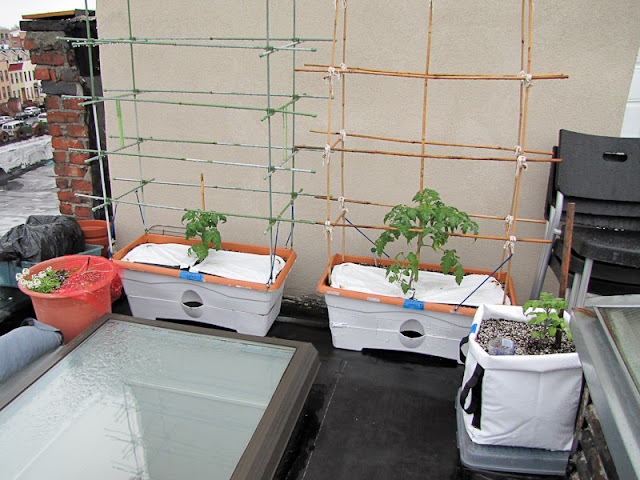 What I find very interesting is that the plants growing in the gardening section that gets the least amount of sun, the new section I opened up this year next to the stairwell, are the plants that are growing the fastest. This area only gets direct sunlight until 12 noon, several hours less than the other gardening sections, but the plants growing here are noticeably larger than the plants growing everywhere else. 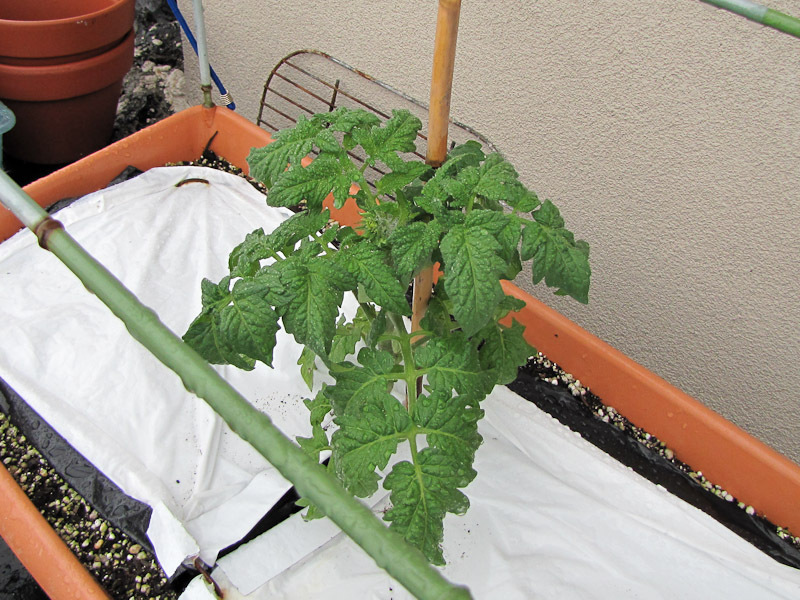 The Summertime Green tomato plant in the photo above was planted at the same time as the Summertime Green plants in the photo below, but as you can see it much larger than the plants that are growing in a location that gets full sunlight. I have no idea why that is, but it certainly is encouragement for me to figure out a way to add more shade to the garden. The wind is shredding all of the pepper plant leaves, especially the older leaves that developed indoors. This is normal for rooftop gardening though so I'm not alarmed. 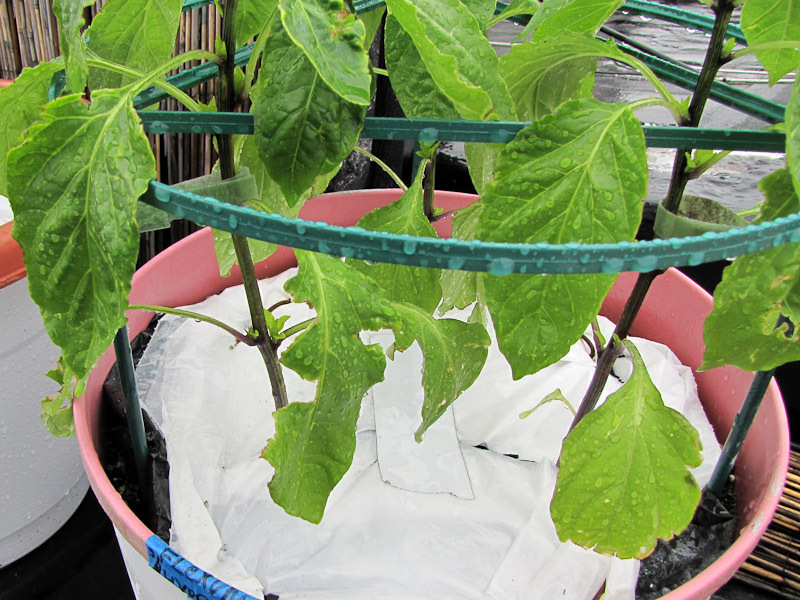 It will take several weeks for the the plants to adjust and put out tougher leaves. Wind gusts can snap unsupported stems so every plant is tied down to their stake/cage. Now that my planting is done it's time to giveaway the leftovers. I have 5 plants to giveaway, 1 Black cherry tomato, 1 Giant Aconcagua pepper, 1 Hakucho Hybrid melon and 2 Summertime Green tomatoes. They are already hardened off so they can be planted immediately, which I highly recommend because their roots are seriously crowded in their cups. Also, whoever gets the Black cherry tomato has a lot of digging to do, there's a lot of stem to bury! I don't have much so I'm going to limit the giveaway to one plant per person, so choose wisely! 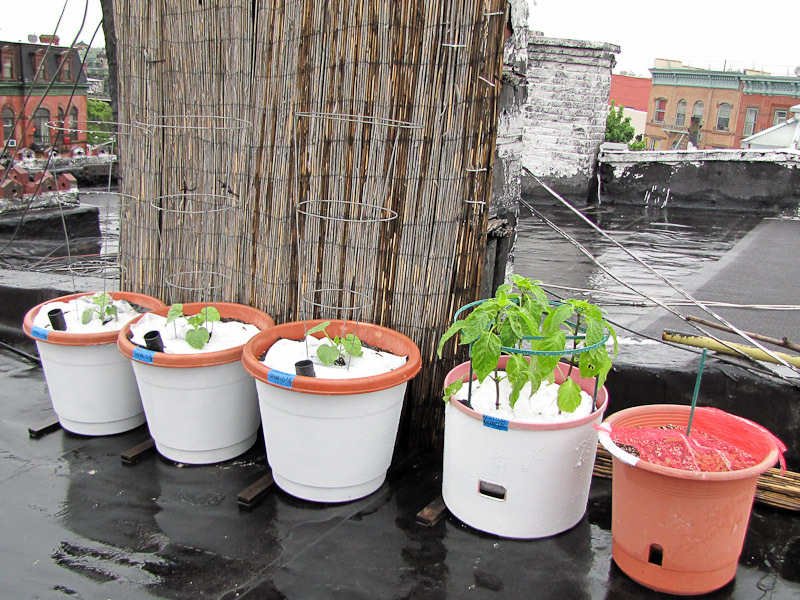 Email me if you're interested in a plant, my email is thegardener at bucolic bushwick dot com. During the week they will be available for pick up at the front desk of my office building in Manhattan, which is just a few blocks from the Union Square subway station. On the weekend they can be picked up at my home in Bushwick. If you're new to gardening I encourage you to email me, there's no better way to start gardening than with a free plant! I can't tell you how thankful I am that you update with photos. My terrace garden over in Manhattan is going strong, and I always like to see if I'm on the right track! Everything on my end seems to be going well, except one of my pepper plants has made very little growth in weeks. (perhaps I planted too early?) Should I abandon ship? Hmmmm, it would depend on how long the plant has been outside and the weather during that time. It hasn't been that cold these past few weeks so I think you're ok there. A plant may look like it is at a standstill, but it could be just focusing it's energy on growing its root system as opposed to putting out new leaves. I would wait at least 4 weeks before I gave up on a plant. You are right! The pepper plant (well, one of them..) made some serious progress this week. I guess slow and steady wins the race with this one. The other pepper just didn't make it. Will have to replace. It's a good decision to replace now, seedlings are still available to buy at the Union Square green market or other retailers, plus there's still plenty of time in the growing season for the plants to produce fruit.